Every time you add new users Windows 7, you will have the option of typing a password for that user, or leaving the user account open to access without any credentials protecting it. Likewise, even if a user account on Windows 7 currently has password protection, you can disable the setting and remove the password for that particular user, as you'll learn in this tutorial. 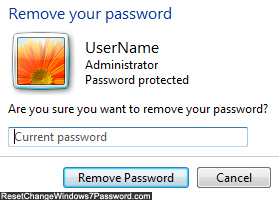 Follow these few steps to remove your Windows 7 password and login just by clicking on your user name icon (and turning off password protection will also let you make some changes to the operating system without having to supply a password - you will instead have to confirm Yes or No at the UAC prompts - this of course also depends on your current UAC prompt settings, which Windows 7 lets you customize). First, open the start menu and type "remove password" inside the search field. To (temporarily or permanently) delete your password and remove protection for access to your Windows profile / user account, just enter your current password as final confirmation, and click on the "Remove password" button. Note that we only recommend using this unprotected setting if you are the only person with physical access to your computer, or if you are sharing your PC with people you truly trust. As soon as you click "Remove Password", Windows 7 will reconfigure your user account and remove any password protection, and the new security setting takes effect immediately. The next time you want to logon to Windows 7 (when your computer starts, for example), all you'll need to do is click on your Windows profile icon to login to your account! Windows 7 Tip: you can leave password protection turned off for as long as you want (i.e., making it a permanent setting), or you can enable and disable the option as needed, and turn the password back on at any point.